Founded at the end of World War II, the Greater Milwaukee Committee’s (GMC) roots lie in the creation of the 1948 Corporation, a group of businessmen initially led by Richard Herzfeld, president of the Boston Store, and Irwin Maier, president of the Milwaukee Journal. They were concerned by the physical and economic conditions of downtown Milwaukee during World War II. In 1945, Herzfeld, Maier, and a variety of leading industrialists, downtown real estate dealers, and other civic elites announced their intentions to create a new civic organization to compel Milwaukee to undertake a variety of major projects to strengthen its downtown. The original name for the nascent organization—the 1948 Corporation—targeted that year as the State of Wisconsin’s centennial. The Corporation’s primary objective was to ask Milwaukee voters to agree to put the city back into debt by publicly financing a series of civic projects, including a new public museum, a lakefront war memorial, an addition to the Milwaukee Public Library, a new baseball stadium, and a network of freeways to connect the region. The debt campaign was controversial, as other political leaders—including future mayor Frank Zeidler—objected to the notion of intentional indebtedness. Nevertheless, Milwaukee voters approved the debt measure in a 1947 referendum. After this successful campaign, the 1948 Corporation decided to become a permanent civic improvement committee and revised its name to the Greater Milwaukee Committee. During ensuing decades, the GMC remained one of the region’s most influential private sector organizations. 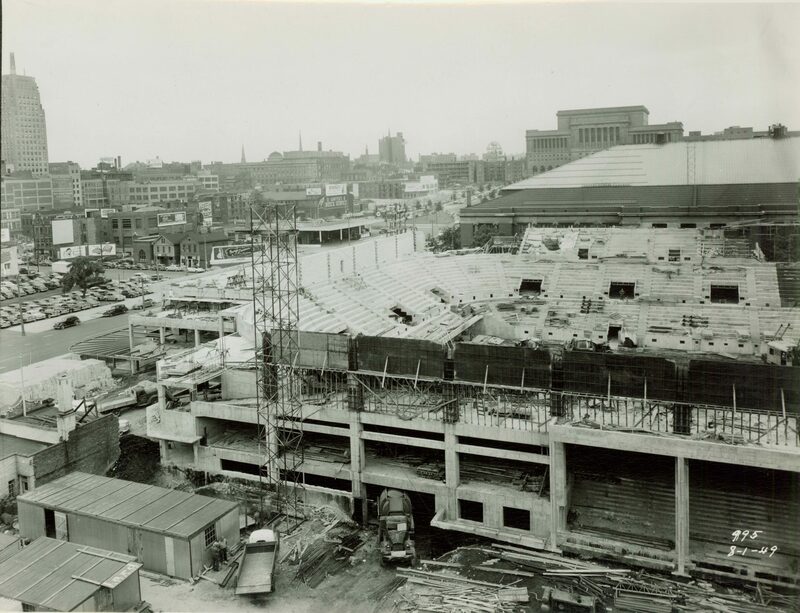 It continued to campaign for a variety of other civic projects, including construction of the Marcus Center for the Performing Arts during the late 1960s, the transformation of the Medical College of Wisconsin into a stand-alone institution during the late 1960s and early 1970s, and later, the construction of Miller Park in 2001. When the Milwaukee region lost thousands of manufacturing jobs in the 1980s, the GMC began to broaden its civic emphasis, focusing attention on education reform, infrastructure, and re-branding the region as a center of innovation. In 2002, the GMC appointed its first female president, Julia Taylor, and the organization’s mission continued its broader focus. Taylor and the GMC played a central role in the 2009 creation of the Milwaukee Water Council, a non-profit partnership of corporations and local universities that seeks to make greater Milwaukee the premier hub of freshwater technology-related research and in the country. Echoing the region’s post-industrial economy, the GMC also launched “Innovation in Milwaukee” (MiKE), a collaboration of local corporations and universities with the goal of developing a workforce oriented toward creativity and technology. The GMC’s changing role as a civic institution could also be found in its growing emphasis on education reform, leading to a permanent Education Committee. The GMC’s education efforts included programs to improve student outcomes in Milwaukee Public Schools, support for vocational education, and an effort to recruit teachers to work in the city’s public schools by promoting the quality of life in the region. ^ Eric Fure Slocum, “Cities with Class? Growth Politics, the Working Class City, and Debt in Milwaukee during the 1940s,” Social Science History, 24, no. 1 (2000): 257-305. ^ Greg Flisram, “Power and Water,” Economic Development Journal 13, no. 3 (Summer 2014): 29-34. ^ Daniel Isenberg and Vincent Onyemah, “Fostering Scaleup Ecosystems for Regional Economic Growth (Innovations Case Narrative: Manizales-Mas and Scale Up Milwaukee),” Innovations 11, no. 1-2 (2016): 60-79. Fure-Slocum, Eric. Contesting the Postwar City: Working-Class and Growth Politics in 1940s Milwaukee. New York, NY: Cambridge University Press, 2013. Rast, Joel. “Critical Junctures, Long-Term Processes: Urban Redevelopment in Chicago and Milwaukee, 1945-1980.” Social Science History 33, no. 4 (2009): 393-426.